Dan Balz of the Washington Post asked me and a number of others to comment on 8 questions about the current presidential campaign. His write-up is here, quoting me on the subject of the debates. Here is what I told Balz in response to several of the other questions. 1. Will the campaign be relentlessly negative to the end? It depends on what “relentlessly” means. I suspect that a majority of ads on the air at any time will be negative. 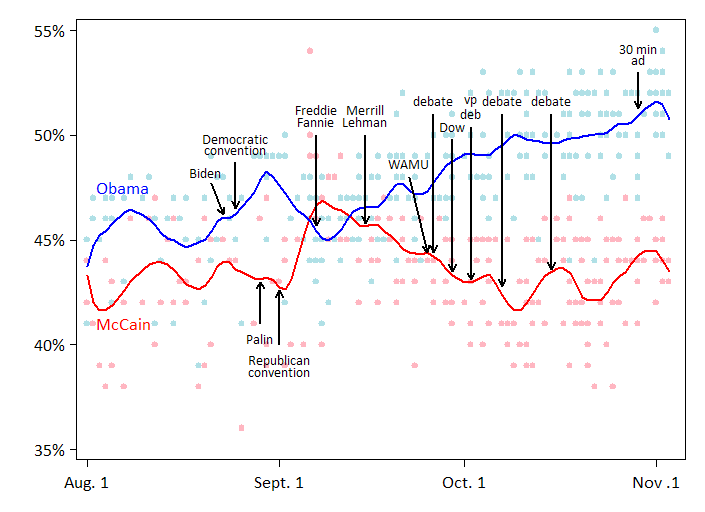 Obama’s and Romney’s ads will probably balance positive, negative, and contrast a little more than they’ve done so far. (Obama’s “The Choice” ad is an example of something other than a pure attack.) But generally ads sponsored by parties and independent groups are much more negative than candidate ads. Given that there will be so many party and especially independent group ads, I expect that the totality of the ads will tilt negative. I also agree with what Balz wrote in his piece: all of the negative advertising so far really hasn’t moved the polls at all. 2. Will Romney’s choice of a vice presidential running mate make any difference? Not likely. There’s just not much evidence that running mates help or hurt that much. Here’s one study. There is some evidence that Sarah Palin may have affected McCain’s chances in 2008. (I know that may sound obvious, but really it’s not. It’s hard to nail these things down, at least by social science standards.) Here are a couple posts on that. Balz’s take was in this same vein. 3. Which campaign is likely to have the advantage in money? At the moment, it seems like Romney and the GOP will—thanks partly to the super-PACs. But will it matter? I don’t know. As I have said, it is possible for spending in presidential elections to matter if one side can out-spend the other significantly. But at the same time, there has to be a diminishing marginal return to this spending. So even if one side has an advantage, it might not amount to many additional votes per dollar spent. Balz writes that “this amounts to too much money chasing too few voters,” and I agree with that. 4. Do Romney’s wealth and business record make him more or less electable? From the analysis I’ve conducted—and I will have more updates on this soon—I’d say his wealth poses a risk right now. But it’s early and that could change. Perhaps Romney will be able to counter the negative portrayals of his wealth and career at Bain. Or perhaps other aspects of the candidates—and some other aspects advantage Romney, not Obama—will provide more important than Romney’s business record. 6. Is the president hostage to the economic news between now and November? On the other hand, partisan biases in perceptions of the economy are pretty evident right now—see Larry’s post. If so, then maybe economic trends will have a more muted effect on the vote than in the past. This may help explain why the polls really haven’t moved even though the economic news of late hasn’t been good. 7. How important are the debates likely to be this year? No more or less important than previous years—which is to say, not that important. At least if “important” means “likely to move the polls.” There have been relatively few the debates that move the polls enough to be truly consequential for who wins the race. I have a forthcoming piece on this that I will link to when it’s available. It will speak both to the social science and to the folklore surrounding alleged “game-changing” moments in previous debates. 8. With the conventions back-to-back, will either candidate get any real bounce in the polls? Balz writes that neither campaign expects “lasting changes” coming out of the conventions, and I think that’s a pretty good bet.